I. Whether or no, any rational man of England, can or may expect any good from a Parliament, when an Armyis in power at the same time in the Nation? II. 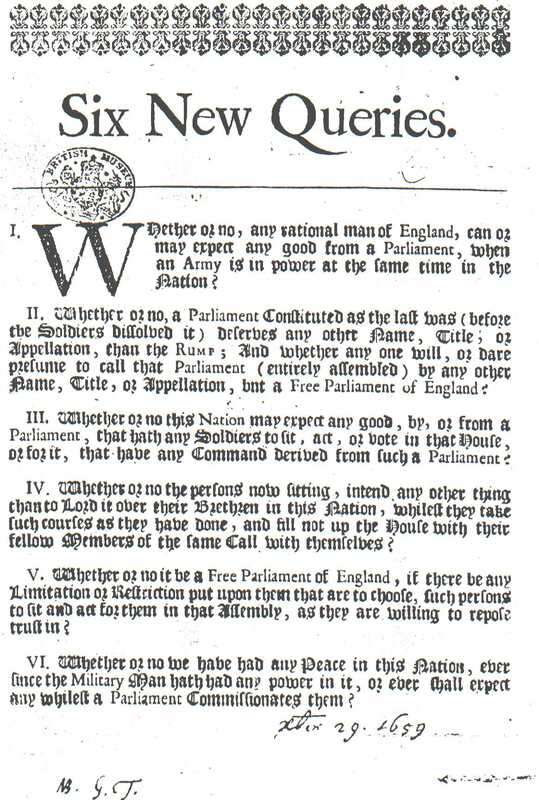 Whether or no, a Parliament Constituted as the last was (before the Soldiers dissolved it) deserves any other Name, Title, or Appellation, then the Rump; And whether any one will, or dare presume to call that Parliament(entirely assembled) by any other Name, Title, or Appellation, but a Free Parliament of England? III. Whether or no this Nation may expect any good, by, or from a Parliament, that hath any Soldiers to sit, act, or vote in that House, or for it, that have any Command derived from such a Parliament? IV. Whether or no the persons now sitting, intend any other thing than to Lord it over their Brethren in this Nation, whilest they take such courses as they have done, and fill not up the House with their fellow Members of the same Call [-ing] with themselves? V. Whether or no it be a Free Parliament of England, if there be any Limitation or Restriction put upon them that are to choose, such persons to sit and act for them in that Assembly, as they are willing to repose trust in? VI. Whether or no we have had any Peace in this Nation, ever since the Military Man hath had any power in it, or ever shall expect any whilest a Parlaiment Commissionates them? Next postThe Peace Symbol's Meaning, and Peace?